My #1 Tax Tip for Scentsy Consultants is to Seek Professional Advice. Find a CPA or accountant who is familiar with the direct sales industry. Every individual and household has unique situations and there is not a one size fits all answer. 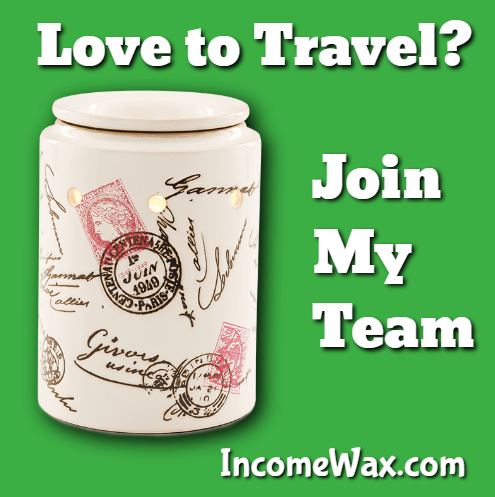 While my corporation name is Income Wax, Inc., is rather clever, it’s not daunting like the dreaded Income Tax. Scentsy independent consultants are independent business owners. We must pay taxes on our income. Other consultants are not the best people to be asking for tax advice. Below is an income tax guide that was compiled by Scentsy. It may be a little too mumbo jumbo or legal-ese for some, which is why I advocate my number 1 tax tip: See professional advice. This was also produced a few years ago, and we know how tax laws tend to change annually. But for the most part, this should be fairly accurate, with the exception of perhaps percentages in the illustrations. DISCLAIMER Scentsy does not advise on any personal or business income tax requirements or issues. Content from this reference is for general information only and does not represent personal tax advice either express or implied. You are encouraged to seek professional tax advice for personal income tax questions and assistance. INTRODUCTION As a Scentsy Consultant, you encounter a myriad of tax issues. This document provides a quick reference for questions consultants commonly face regarding operating a Scentsy business from a tax perspective. Many of the explanations and examples are of a technical nature and may require multiple readings. Exploring the document as it applies to your questions rather than from start to finish is recommended. The majority of Scentsy Consultants are sole proprietors. What does that mean from a tax perspective? Being a sole proprietor means you operate a business for yourself and a separate legal entity under which the business is operated is not established with the IRS. Sole proprietors are required to complete Schedule C Profit or Loss From Business which demonstrates items of income and expense realized by the proprietor related to their business during the year and is submitted together with Form 1040 to the IRS annually. I’ve been told sole proprietors are required to pay self-employment taxes. How do sole proprietors pay these taxes? A sole proprietor operating their own business is required to pay self-employment taxes on income which exceeds $400 as calculated on Schedule C. Self-employment taxes are the equivalent taxes an employee and employer pay in an employment relationship. Employees have 7.65 percent of their pay withheld to pay Social Security and Medicare. The employer matches the 7.65 percent withholding amount and remits the 15.3 percent (7.65 percent employee portion + 7.65 percent employer portion) tax to the IRS. As a sole proprietor, you are both the employee and the employer, so both portions must be paid by you. This tax is remitted to the IRS in the same way your federal taxes are remitted – either in estimated payment vouchers (found at www.irs.gov by typing 1040-ES in the search box) throughout the year or simply when you complete your Form 1040 and pay the amount due when your annual return is filed. How can I know if I need to complete estimated payment vouchers during the year or if I can just pay at the end of the year when I file my 1040? This is not an easy determination to make, since the answer depends on what types of other activities exist besides your Scentsy business. Examples include your federal tax withholding if you have employment other than your Scentsy business, a spouse’s federal withholding amount from his/her employment, etc. However, penalties will not be assessed by the IRS on underpayments of taxes as long as 110 percent of the amount of federal taxes owed in the prior year is paid in during the current year. Illustration: If the total tax on line 61 from your 2012 tax return (prior year) was $5,000, no underpayment penalties would be assessed, regardless of the total amount owed for 2013 (current year), as long as $5,500 of federal taxes were paid in during the year through federal withholding from employment checks of you or your spouse. However, if no employment earnings exist outside of the Scentsy business on which federal taxes are withheld during the year, quarterly payment vouchers would need to be prepared equaling $5,500 to avoid underpayment penalties (assuming a tax liability ultimately exists), as no federal withholding occurs on Scentsy commissions. Many Consultants organize themselves as an LLC or an S-Corporation rather than operating as a sole proprietor. What are some of the common motivations for this? 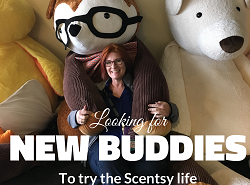 Limited Liability Company (LLC) – The most common motivation for organizing a Scentsy business as an LLC is to form a partnership with friends or family so that more than one person can operate the Scentsy business under a single Scentsy Consultant identification number. Benefits of LLC formation are therefore usually not tax related but are pursued because of unique circumstances, as active LLC members receive no tax preference in operating as an LLC over sole proprietors. Active LLC members pay the same amount of self-employment taxes as sole proprietors. S-Corporation – Although an ancillary benefit of S Corporation formation is the ability for more than one person to be a shareholder, the most common motivation for organizing a Scentsy business as an S-Corporation is to minimize self-employment taxes paid. While a sole proprietor is required to pay self-employment tax on the business’ annual net income, S Corporations pay employment taxes only on wages. The process for determining the tax bill on the same amount of income earned under an S Corporation organization is different than for a sole proprietor or an LLC. An IRS requirement is for a reasonable salary to be paid to an S Corporation shareholder providing services to the entity on which employment taxes must be paid. The IRS’ intent with this law (§1366(e)) is to prevent small business owners from avoiding employment taxes entirely since the income of the S Corporation itself is not subject to employment taxes. If the IRS believes the salary you paid yourself and on which you were required to pay employment taxes is not sufficiently high and an appropriate representation of the services rendered, an agent can propose a salary adjustment for an accurate reflection on audit. The difference in the amount of employment taxes paid because of S Corporation formation is illustrated in the tables below. What is the purpose of the 1099-MISC? Can you provide additional guidance on why it’s issued, to whom it’s issued, and what the amounts represent? The IRS requires Scentsy to send an annual 1099-MISC (by January 31) to all Consultants with commissions and awards of at least $600. If a Consultant’s earnings does not reach $600, a 1099-MISC will not be created since no data is required to be transmitted to the IRS regarding the Consultant. The purpose of Form 1099-MISC is for the IRS to be able to cross-check that amounts reported by Scentsy, as payments made to Consultants are appropriately represented as items of income by the Consultants to whom those commissions and awards were paid. Each March 31, Scentsy transmits an electronic file to the IRS of the amounts shown on the 1099 provided to the Consultants on January 31, two months earlier. The two-month difference between when forms are provided to Consultants and when they are transmitted to the IRS is intended to provide sufficient time for the recipient (the Scentsy Consultant) to notify the issuer (Scentsy) of any reporting errors such as an incorrect Social Security number, a misspelled name or inaccurate amounts. For Consultants filing tax returns as sole proprietors and completing Schedule C, the IRS will expect to see as gross receipts on Line 1 of the income section of Schedule C at least the amounts transmitted by Scentsy to the IRS in Box 7 of that form. “At least” is emphasized above since additional income which Scentsy does not report on the 1099 such as the Consultants’ resale of free or half-price items should be tracked by the Consultant and reported in addition to commissions and awards received. The amount shown in Box 7 represents commission payments made to a Consultant during the year as well as awards that were granted because of services performed such as incentive trips. The Box 3 amount represents the fair market value of prizes given to Consultants that are not for services performed, such as random drawings. Why does it matter whether amounts are reported in Box 3 or Box 7 on my 1099? Does it make a difference? The location on Form 1099-MISC where amounts are reported is dependent on whether services were rendered towards receiving the commission or prize. Box 3 is for prizes and awards, not for services performed, while Box 7 is for prizes and awards for services performed. Box 3 amounts flow to Form 1040, Page 1, “Other Income,” and are not subject to self-employment while Box 7 amounts are generally subject to the self-employment tax and are reported on Schedule C of the Consultant’s annual tax return. Which commission payments are included in the calculation? The amount shown in Box 7 represents check amounts sent to the Consultant during a calendar year. For this reason, the December commission check of the previous calendar year will be included in the 1099 since it was sent in January of the current calendar year. The December commission check of the current calendar year will not be included since it wasn’t sent until January of the following calendar year. Illustration: The December 2014 commission check will be included on the 2015 form since it was paid to you in January of 2015. The December 2015 commission check amount is not included on the 2015 form since it was paid to you in January of 2016. I have heard there is a special law which allows you to immediately write off the purchase of a vehicle used for business rather than gradually expensing the cost of the vehicle (depreciation) over five years? Is that correct? Are there any limitations for this? 179 is a special law that allows immediate expensing of assets for small businesses rather than depreciating the asset purchased for the business over time. However, to be eligible for §179 expensing, the vehicle must be used for business purposes more than 50 percent of the time. Listed property is property whose nature lends itself to personal use and therefore the IRS creates additional limitations. Automobiles (vehicles with gross vehicle weight (GVW) less than 6,000 pounds) and trucks (vehicles with GVW exceeding 6,000 pounds) are considered listed property and §179 is limited to $11,160 for autos and $25,000 for trucks. In other words, if a truck with a GVW of 5,000 pounds is purchased for $40,000 under a sole proprietorship, the maximum amount available under §179 is $11,160 since it will be classified as a passenger vehicle because of the GVW under 6,000 pounds. The remaining cost will be depreciated using the standard tables over five years. If the truck has a GVW greater than 6,000 pounds only $25,000 of the vehicle can be expensed under §179 because of the listed property limitation on vehicles. Electing §179 immediate expensing on assets occurs on IRS Form 4562. Although utilizing the election may not be overwhelmingly advantageous for vehicles because of listed property limitations, it is a valuable election to use on the purchase of other business assets not subject to special limitations. Illustration: A Consultant purchases a computer for $1,000 for their Scentsy business and does not elect §179. The depreciation expense in year one would be $200. Therefore, the Consultant’s income on which they are taxed for that year will be $200 less because of the depreciation expense calculated from IRS tables. The computer would continue to be depreciated over its IRS defined useful life according to IRS depreciation tables. However, the Consultant could instead elect §179 on the computer purchase. The effect of this election would result in entirely expensing the cost of the computer in the first year and lowering the Consultant’s taxed income for that year by $1,000. Although no depreciation expense is allowed after the first year when §179 is chosen since the entire cost has already been expensed, a Consultant seeking to lower taxable income sooner rather than later can benefit from this election by speeding up the timing of allowable deductions. Ultimately, the amount of the depreciation expense will total $1,000, but the timing of the depreciation can be altered based on whether §179 is elected. The difference in the depreciation by year is illustrated in the table below. I’ve heard that I can deduct either actual miles driven for my Scentsy business or other expenses such as gasoline or repairs associated with my vehicle. What information must be kept to substantiate the deduction? Which method is more beneficial? Expenses on a car or truck used in a business can be substantiated in a couple of different ways. First, you could keep all the business expenses on the car and deduct that amount. Examples of actual expenses include fuel, oil, license, insurance, repairs, depreciation, parking fees and tolls. If you choose to deduct expenses this way, you must have a receipt to demonstrate the amount placed as a deduction. Also, if you select the actual expenses method you’ll need to remain consistent using that method in future years. See IRS Publication 463 under the section “Actual Car Expenses” for more information on how to figure your auto expenses. Another method for deducting business vehicle expenses is to deduct the Standard Mileage Rate for business miles. This is a rate determined by the IRS that is intended to represent the above stated deductions. For 2015, the rate is 57.5 cents per business mile (https://www.irs.gov/pub/irs-drop/n-14- 79.pdf). If you choose to use the standard mileage rate, you must keep a timely logbook which tracks the amount of business miles used on the vehicle during the year. The information your tax preparer or the tax preparation software will request if the actual miles method is utilized includes the date the vehicle was placed in service for business purposes, the number of business and personal miles and whether you have evidence (your log book) of the actual number of miles. Although personal miles are requested on the tax return, you don’t have to keep a log book of miles other than business miles. Simply record your automobile’s odometer reading at the start of the year and again at the end of the year. If you keep a record of business miles, you can subtract your business miles from the total miles driven during the year to arrive at your total personal miles. Keep a log book in your car’s console and record mileage when your auto is used for business purposes. In the first year you will be reporting vehicle expenses, you may decide to retain all required receipts of actual expenses as well as a logbook demonstrating miles driven to see which method gives you a higher deduction and which is easiest to continue in future years. Most tax software preparation packages, such as TurboTax, have great modules for inputting this data when you’re ready to prepare your return and the software will determine which method provides the greatest deduction for you. If I put a Scentsy vinyl on my car for advertising purposes, can I claim all my miles as business miles since I am attempting to advertise as I drive? No, this is a common fallacy. You can deduct the cost of the vinyl and the cost of the labor associated with putting it on the car as an advertising expense but the miles driven are not automatically classified as business miles simply because of the existence of a decal. When I take orders to work with me for delivery to customers that are coworkers, can I use those miles as a deduction? It depends on the primary purpose of miles used on your vehicle. If the primary purpose of the trip is to make the Scentsy delivery, then those miles can be used in the deduction. If the primary purpose of the trip was to go to work, then those miles shouldn’t be used in calculating the deduction for vehicle expenses. This logic should be followed for trips that involve both personal and business purposes. I’ve heard that if you lose money for four years in a row, your business isn’t considered a business by the IRS and will be reclassified as a hobby, disallowing any expenses. Are you able to verify whether this is true? Does the taxpayer depend upon income from the activity? If your answers to these questions indicate that you have a profit motive then it is unlikely a reclassification from a business to a hobby will occur, regardless of the number of years of unprofitability (see Internal Revenue Code §183). Do I have to include in my business income products I receive for half off or free but keep for my personal use? What if I resell the products? Similarly, if you resell free product the amount received should be included in income. Consultants using the 1099-MISC as their sole basis for preparing their income tax return should track and add free products retained or sold during the year. Ensure that if you have already included in income the FMV of free product received, that the proceeds from selling the product are not also included in income or duplication of tax will occur. Additionally, the difference between the amount paid for half-price items and the price for which they were resold should also be included in income. Presently, the IRS has not issued guidance on the treatment of half-price items retained for personal use. If an audit arises and the items are questioned, Consultants retaining half-price items for personal use can likely demonstrate that the items were sale priced items without inclusion in income of the discounted portion of the product. I had some personal expenses from an incentive trip that I wouldn’t have incurred if it wasn’t for my Scentsy business and the networking I did because of the trip. Can I deduct those? Unfortunately, you will have to determine which items during your trip were businesses related and which were personal in nature and deduct only the business related expenses. However, as long as the primary purpose of the trip is business and more than half of the days were business rather than personal or vacation days, you can deduct 100 percent of your transportation (e.g., airfare, gas for travel, etc.) costs (IRC §1.162-2(b)(2)). I have heard there is a deduction available for the portion of my home I use for my Scentsy business. Is this a worthwhile deduction? It can be, but before you decide to deduct expenses for business use of your home you might want to consider that in order to qualify for the deduction you must meet certain tests. The part of the home used for business must be used regularly and exclusively for business. It can be a room or a portion of a room and should be separately identifiable to be exclusive. Occasional or incidental use of the room is not regular use. Effective Jan. 1, 2013, two methods now exist for determining the amount of the deduction you are eligible to take. The first method can be calculated as follows: If you have a room or area that qualifies as a home office and you have indirect expenses such as utilities, you will take a percentage of the total expenses applicable to the space the home office occupies. Illustration: For example, if your home office occupies 10 percent of your home, then 10 percent of your electricity bills become tax deductible. Some of the expenses you can deduct for your home office include the business percentage of rent or mortgage, property taxes, utilities, homeowner’s insurance and home maintenance that you pay during the year. However, the new simplified method announced by the IRS in 2013 requires less administrative hassle or calculations. You are allowed to simply measure the square footage of the area utilized for the home office and multiply that figure by $5 a square foot to determine your home office deduction. Be prepared to defend your deduction in the event of an audit by having measurements of the area and copies of bills or invoices to substantiate your expenses if you choose the first method. Also, home offices may require physical observations on audit so you’ll also need to demonstrate the exclusivity of the area for business purposes. Follow the instructions on Form 8829 at www.irs.gov for more details. I did a local fundraiser and donated my commissions to the charitable organization. Does it make a difference in taxes how I classify the donation? Yes. Depending on the classification (advertising expense on Schedule C vs. charitable contribution on Schedule A) and amount of the commissions donated, some Consultants could lose money on fundraisers after paying applicable taxes. If an amount is earned and given to charity, self-employment taxes will still be owed on the amount donated if it is classified as a charitable contribution and reported on Schedule A. However, if the amount is classified as an advertising expense, a direct reduction in the amount of business income earned, it will result in no taxes owed on the amount donated. Classifying commissions donated to a fundraising organization as advertising is not a decision that should be made without careful consideration, however. An IRS auditor could reclassify the amounts from advertising to charitable contributions if he does not feel a reasonable relation to the business exists in gaining sales by donating the commissions. Illustration: Three different fact patterns are explored below that demonstrate the tax consequences of a $5,000 donation on a $5,000 commission to a charitable organization for a fundraiser. The first two examples classify the amounts donated as charitable contributions and the third example shows the tax results when the donated commission is classified as an advertising expense. Example 1 – The Consultant earns $5,000 and donates the full amount to the fundraising organization. When tax time arrives, the 1099 reflects the $5,000 of earnings and the Consultant reports the amount earned on Schedule C as Business Income and the amount donated on Schedule A as a Charitable Contribution. Self-employment taxes on the $5,000 earned of $765 along with Federal ($1,250) and State ($315) taxes results in $2,330 of total tax. However, the charitable contribution deduction from Schedule A on the amount donated offsets the Consultant’s federal and state taxes by $1,250 and $315, respectively. The end result of additional taxes owed on the amount donated is the amount of self-employment taxes of $765. Example 2 – Example 2 is identical to Example 1, other than the Consultant not having sufficient deductions to itemize. Each year, the IRS publishes a stated amount that is allowed as a standard deduction amount. Taxpayers have the choice of itemizing deductions or taking the applicable standard deduction amount, whichever figure will result in a higher deduction. This Consultant does not have sufficient itemized deductions (e.g., mortgage insurance, property taxes, state taxes, charitable contributions, etc.) to cause the consultant to choose to itemize. Therefore, the charitable contribution deduction from Schedule A on the amount donated has no offsetting effect on the Consultant’s federal and state taxes of the $1,250 and $315. Thus, the end result of additional taxes owed on the amount donated is, the sum of self-employment taxes of $765, federal taxes of $1,250, and state taxes of $315, totaling $2,330. This means that not only did the Consultant donate their $5,000 commission, but also paid $2,330 of taxes on the donated commission. Be careful! Example 3 – In Example 3, the Consultant chooses to classify the amount donated to the fundraising organization as an advertising expense because of the goodwill developed and new clients attracted through the event. No taxes are owed on the amounts earned, donated and classified to advertising expense as a direct reduction in the amount of business income earned results on Schedule C ($5,000 income – $5,000 expense = 0). The topics covered in this document were determined by emails received, discussions with Directors at Boot Camps and phone conversations with Consultants. While most questions specific to your personal situation are best answered by a tax professional familiar with your circumstances, the quick reference guide can be expanded to include other topics if sufficient demand exists from a common population. 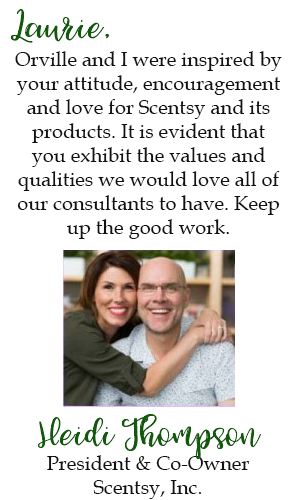 If you have questions you believe are applicable to the general field of Consultants, please submit them to finance@scentsy.com for consideration. We hope this document will be a valuable reference tool in operating your Scentsy business as you encounter commonly faced tax issues. Good luck! Another Monster Monday, Scentsy’s 24-hour flash sale, will kick off TODAY at 3 am PT (4 am MT, 5 am CT, 6 am ET) Monday, Oct. 22 with savings of up to 80 percent! You won’t want to miss this additional flash sale, which will include more Select products from our Home, Scent, Kids, Laundry, Body and Clean lines and more. Increased traffic to the Scentsy websites may cause slowdowns. We will have queuing ready! When we hit a certain volume of concurrent users on the system, your will see a splash page with an estimated wait time. Want to know what’s sold out? Visit our Scentsy Facebook page for an up-to-date list of flash sale products that have sold out. Make sure you refresh your page every time you visit! Sale products will be available on my website at www.IncomeWax.com. Try your luck. Have Patience. Get amazing deals! This promotion is only available from Sept. 1 to 11:59 p.m. (PT) Sept. 30, 2018. *Plus local sales tax and $10 shipping. Pack your bags and sunscreen and let’s go! Oh wait … before you do, one minor little detail, you have to enroll as a consultant and then earn the trip. Both very doable! Enroll here. Former Scentsy Consultants: Reinstate yourself by logging into the workstation. If you need a sponsor, select Laurie Ayers.